As I have studied God’s Word, considered my life, and talked with others about theirs, I have come to the conclusion that there are three areas of concern that trigger worry and anxiety within us: sustenance, acceptance, and assurance. I want to begin by addressing sustenance, and hopefully presenting some tools of Truth to guard against worry in this area. The passage above, from Matthew chapter six, reminds me that in Jesus’ time, just as today, we can all get caught up worrying about whether or not our needs will be met. Food. Shelter. Clothing. If you’re anything like me, you want to make wise decisions that hopefully lead to the best outcomes in this physical and material life. But it can so easily become a worry trap for us. So much so that losing a job or being diagnosed with a disease can lead us down a spiral of anxiety, fear, anger, and struggle against God. Yet Christ tells us not to worry. But how can we do that? How can we untangle worry from wisdom and become mentally and spiritually unshakable in the midst of troubles (which Jesus reminds us each day holds)? What can take our minds to that ‘more than’ place? How can we have different priorities and different ambitions than the unsaved who clamor after wealth and power and beauty and comfort? Do you set your hope on retiring comfortably, or on hearing ‘well done my good and faithful servant’ when your sojourning on this earth is done. Do you set your hope on avoiding all ailments and staving off aging, or is it in working to build His kingdom? Do you set your hope on a stable, comfortable life, or on the glory that is to be revealed in eternity? Hope and worry cannot coexist. Hope is in the eyes of a bed-ridden old woman gracefully facing the end of her life. Hope is in the heart of the missionary who willingly sacrifices his life so that even one soul may receive that same earnest expectation, which is in Christ. Hope in our Heavenly Father and the glory He has waiting for us is what makes it possible for us to bear up under the heaviest trials. Why don’t we need to worry about our lives? Because God will provide. And if He chooses not to provide in the physical ways that make sense to the unbelieving, we have an utmost assurance that He has made the ultimate provision in Christ – a provision which provides an eternity of abundance. After all, our testimony to the world is not seen when we enjoy good circumstances, but when we have hope in hopeless times. 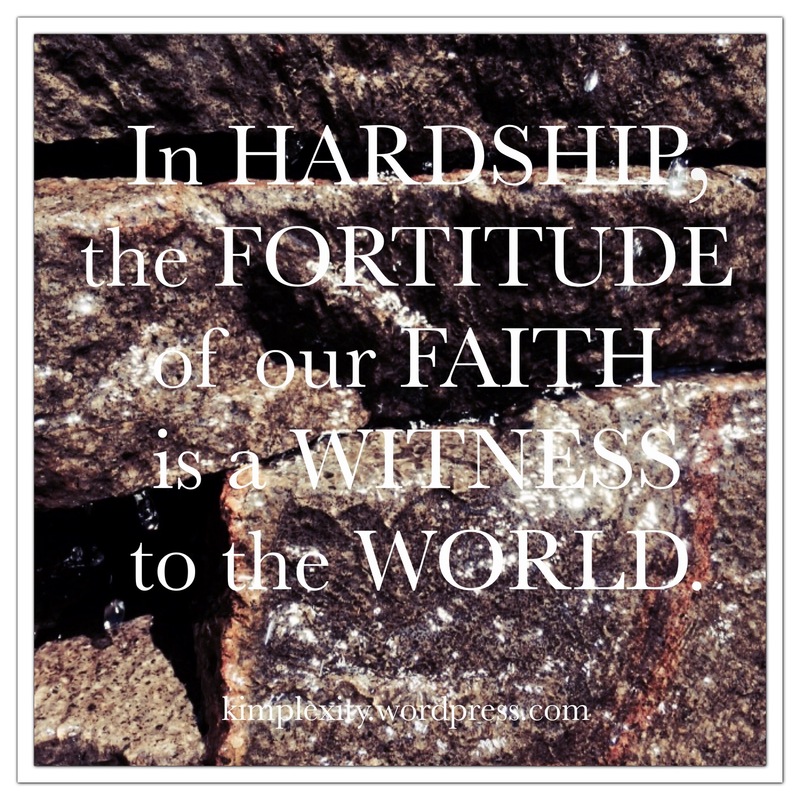 It’s in hardship that the fortitude of our faith can be a witness to the world.